This story took place a long time ago or it may even be in the future. Nobody knows exactly which year it was. In any case it was a time of dramatic change, and it was also the time when the Jesters became more organised and influential. They, in fact, were a living sanity, planted in the fast changing times. Just before this, very different balances of power had been the order of the day. For instance, at that time ‘being right’ was determined by the function and the position of a person rather than by them being able to present sound arguments or well-grounded reasons. This system caused a desire in all people to be found to be right as well. So legally established titles such as lawyer, manager, president, public notary and so forth, provided a person with the power to be right, but whether such people were in fact right varied from moment to moment. It was really more a matter of the effect of seeming to be right than about actually being right. It was a misleading situation, as the public, sometimes en masse, agreed, that so called ‘important people’ were always right, without ever having thought about the matter themselves. The Jesters, however, changed all this. 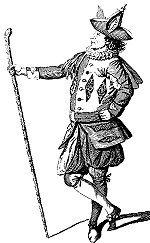 In Topaz 14 we reported on an important court-case against the City Jester of Utrecht and about his valiant efforts to question ‘the place and importance of identity in these times of change’. In this Topaz however we feature an exclusive report of a recorded conversation between the court-Jester and the King about ‘the changes’ themselves and about the ‘necessary sanity’ to survive them. The recording begins a few minutes after the conversation started. What went before remains unknown.